A couple of years in the making, a new album by the reunited SANTANA is almost upon us. 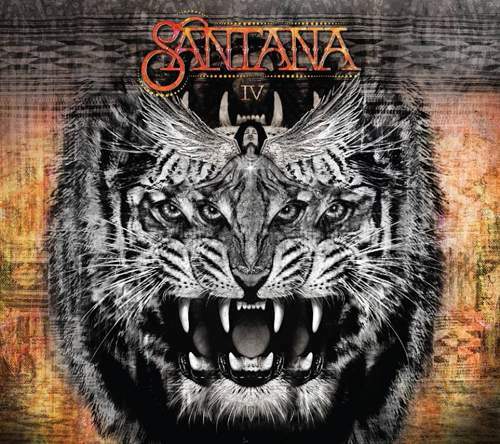 Scheduled for April 15, “IV” picks up where 1971’s “Santana” – also known as “Santana III” to avoid confusion with the band’s 1969 debut – left off, and bears its leonine motif on the cover. Kicked off by an idea for another collaboration between the ensemble’s guitarists, Carlos Santana and Neal Schon, the record sees the gathering of the two with singing organist Gregg Rolie, drummer Michael Shrieve and percussionist Michael Carabello. They’re joined – since original bassist David Brown died and long-standing timbalist José Areas opted out – by current SANTANA players Benny Rietveld and Karl Perazzo.